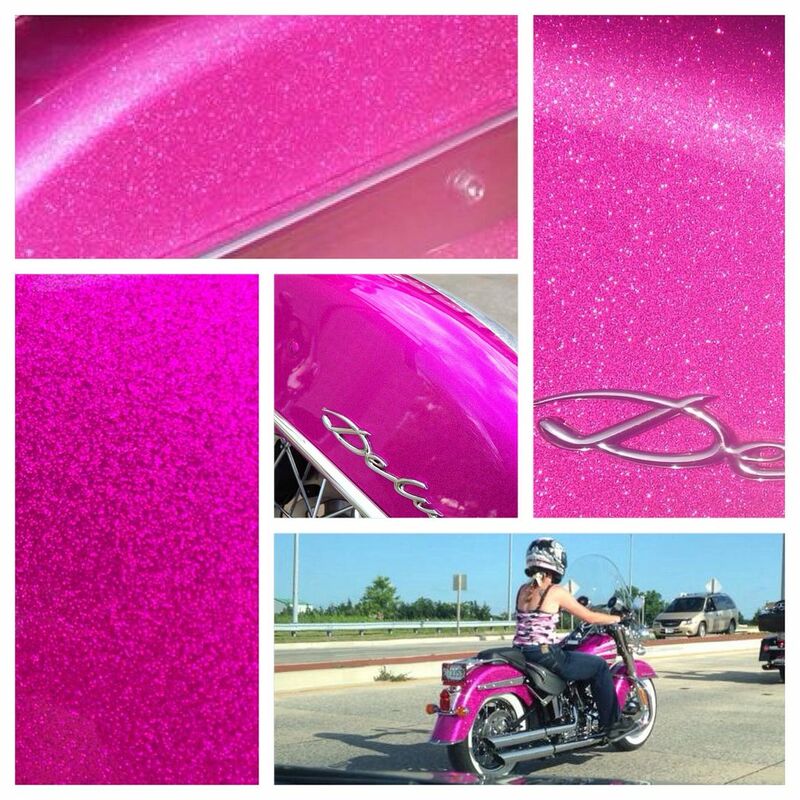 Yes, a pink, sparkly, glittery motorcycle. My jaw dropped. It was beautiful and I had to have it...on my nails. Needless to say, my husband wasn't surprised when I told him to "FOLLOW THAT BIKE!". We followed it for a few miles until it pulled into a shop. I got out of the car and partially skipped over to them, trying to contain my excitement. I asked if I could take a few pictures of the bike as I wanted to have someone create a nail polish that matched it. She was so excited to hear that because she had been looking for a polish to match it as well. This is three perfect coats of Lacquistry Motorcycle Mama on my pinky, pointer and thumb. On my ring and middle I did two coats of Cameo Colours Lacquers Lusty (no holo) topped with two coats of LynBDesigns Don't Blink. All topped with A Girl Obsessed Magpie Shine top coat. Motorcycle Mama is AMAZING!!! I swear, Jenna is the queen of perfect glitter polish. 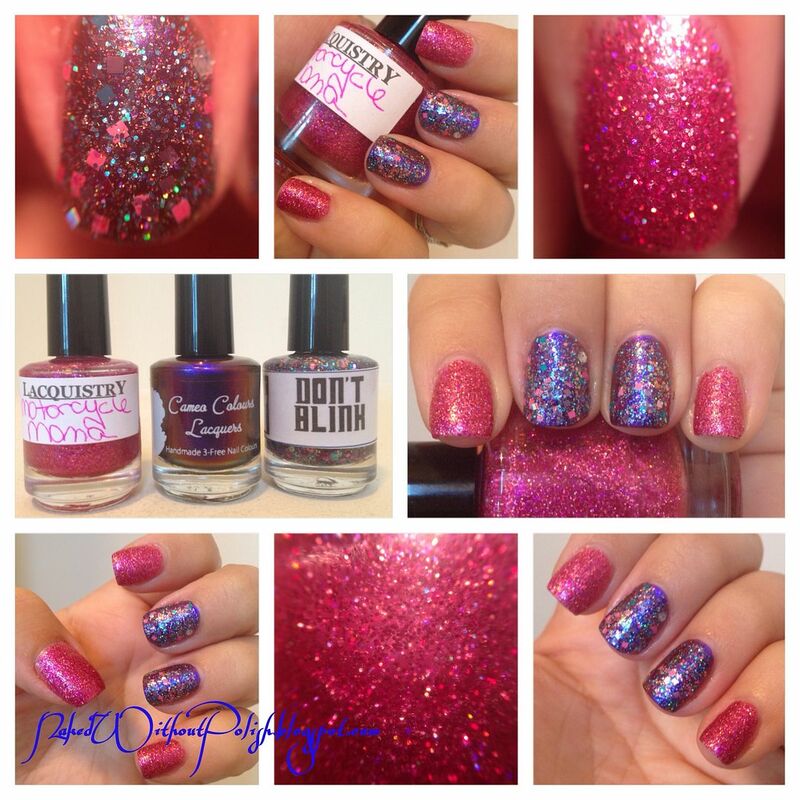 It's a bright pink/magenta scattered with holo. Perfectly opaque in 3 coats. Cameo Colours Lacquers Lusty is a beautiful ultrachrome that shifts through blue to purple to gold-ish green to warm red. It applied like butter and was opaque in two coats. LynBDesigns Don't Blink is a clear base packed with holo, multi-sized squares in pink, purple and teal. It was the perfect combo to pair with Motorcycle Mama. Motorcycle Mama was a custom, but I'm sure if you wanted a bottle, she'd make one for you. It's fabulous!! Lusty is currently sold out, but when it's restocked you can grab a bottle for $10. You can even get it with holo added. Don't Blink is available for $8. Loving this manicure. It's so sparkly and puts a smile on my face on this overcast Friday.